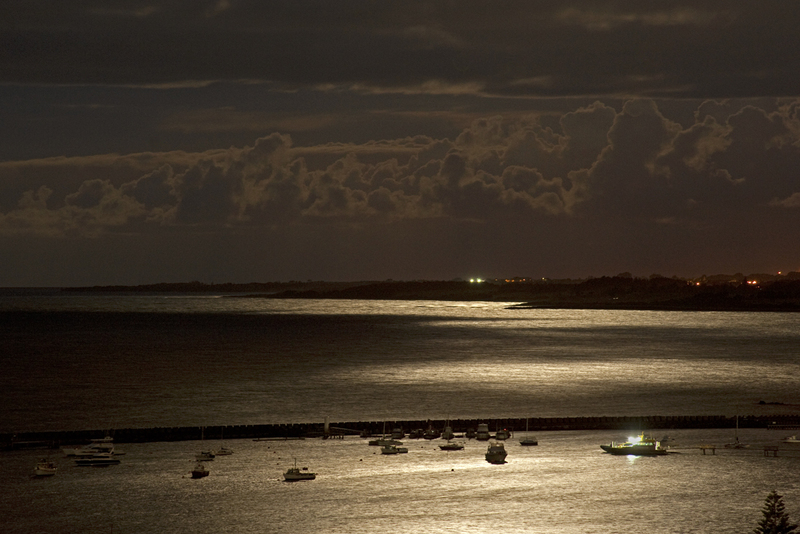 Northeast across the Haven by moonlight. 10.21pm, 20 February 2019. 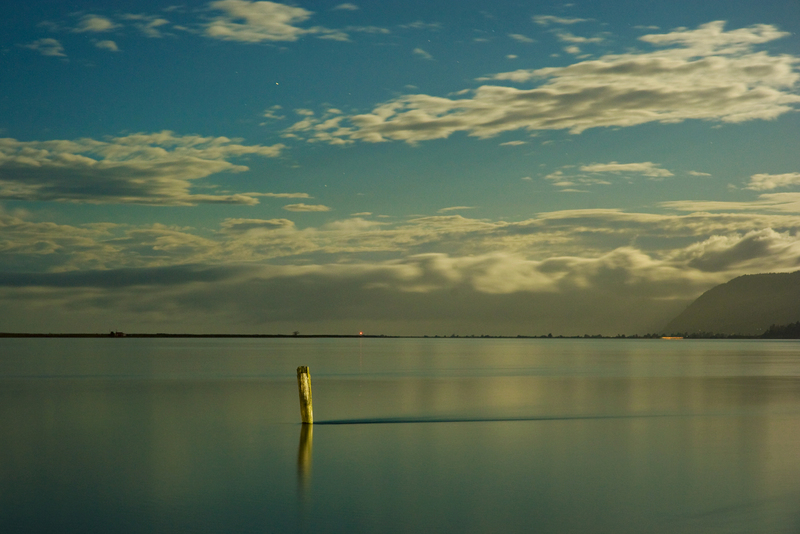 A longer exposure would blur the clouds (depending on your lens). Wide angles show less cloud movement, so the equivalent limit for sharp clouds on my 28mm lens could be as much as a minute. Cloud streaks, the opposite effect, need about 2 minutes to look really good, but again, a longer time on wide angle shots. The single pole and the wake of the incoming tide deliver a composition of rough thirds, a little formulaic but always easy on the eye. There’s a small headlight streak below the bluffs that a longer exposure would have made more of, plus a beacon light on the Boulder Bank, which is not otherwise discernible. Much of the original upper Haven has been reclaimed. What a lovely summer’s evening this was – balmy and without even a sea breeze. For the fisheries officer with the strong torch it was just another round of inspection but clearly my presence lacked line and bait. 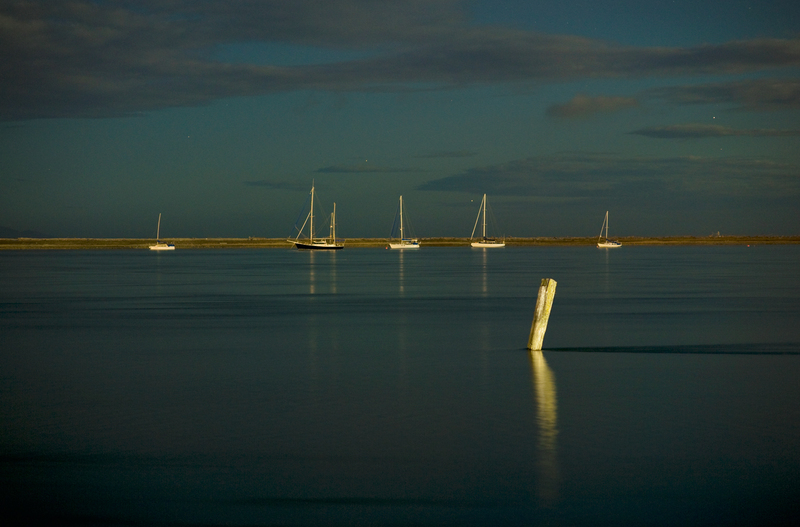 The short exposure has given a sharp outline to the boats, which on a longer shot invariably jiggle with the tide (still rising, as the current to the right of the brightly lit post suggests). The light is a mix of ambient city and port lights, plus the moon, which had only risen over the hills a short time before. I was at the very end of the reclamation project of the 1980s, which extends halfway across the Haven. Here we are looking northwest to the Boulder Bank which encloses it. This is JULY in my 2019 Modest Epiphanies calendar – still available for your purchase, by the way. This winter angle on the tidal flat behind Tahuna Beach benefits from its split focus and from two figures captured by chance (someone with their dog; I saw no one at the time). The split focus involves firstly a close focus with the telephoto, and beginning the half-minute exposure with flash, then immediately moving the lens barrel to infinity, for the remaining 29 seconds of the exposure. This routine is an awkward one to repeat, but the challenge is to get a balance in the lighting between the flash-lit foreground and the moonlit background. On the tidal flat much of the lighting came from the adjacent motor camp, but fortunately that too has balanced with the low power of the moonbeams. I could name the dog walker as Sara N. Dippity – thank you Sara. 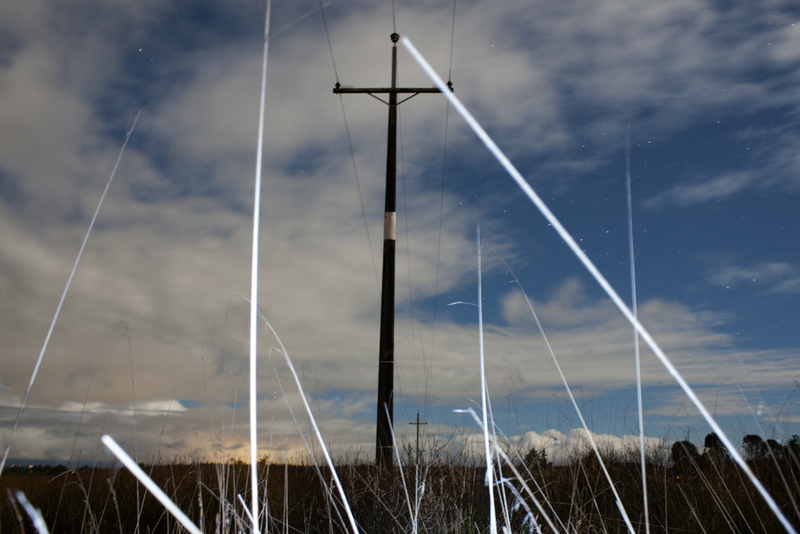 This demonstrates that not everything that intrudes on your long exposure frame is a spoiler. Compositionally the usual challenge at beach locations is finding something interesting to populate the foreground, to add interest and a sense of depth. 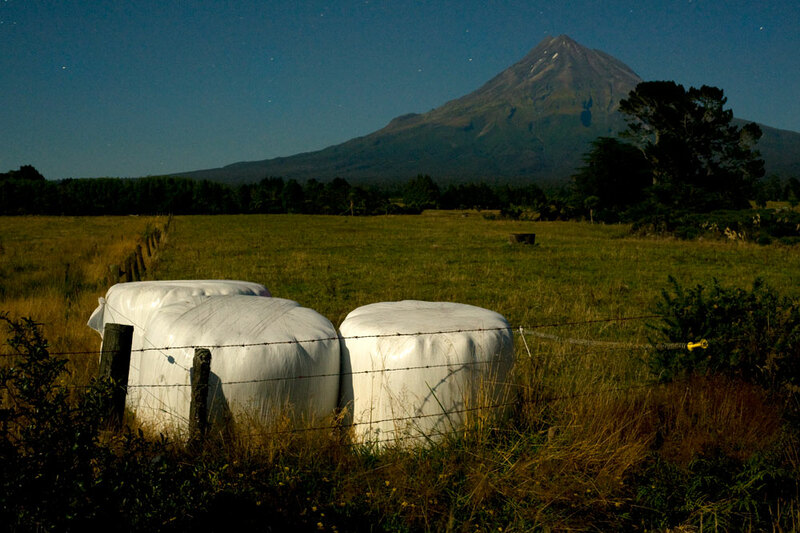 Mt Taranaki by moonlight, from Wortley Rd. The lights of Inglewood shine below. An unexpected First World Problem has been developing in western countries in recent years. It is an odd one, to be sure, and some might say it’s a “Giraffe in the Room” (the elephant needs a day off every so often). This is it: Considering the billions of images we now take every month on our cameras and smartphones, where can we see any of these photos? Certainly not on our walls, as even my own have been bereft of recent imagery. Why are we taking so many photos when so very few get to be printed, and still fewer get framed or pinned up somewhere? Why isn’t all this great creativity on display for all to see – such as on the walls at home, your house and mine? I call this the problem of Wall Art Poverty, a serious middle class malaise, perhaps not fatal but surely damaging to ours souls, which according to Picasso need daily nourishment*. We seem to be stonkered by the deluge of pixels captured on our marvellous little machines. What to choose to show, and how do you present it? These are the questions I have been asking myself too, as I prepare a first selection of my photographs to offer as fine art prints. The above is the image I began this blog with, in 2010. It graced the cover of my first calendar, and will be one of the images featured in my first offer of fine art prints. A frame from my forthcoming Modest Epiphanies 2019 New Zealand Calendar, soon to be announced. It shows urban infill below an old Maori pa in Westown, a long established suburb in New Plymouth. A slow motion study in suburban subdivision, this last section of the subdivision development was unbuilt on for years, yet the street lights have shone every night regardless. 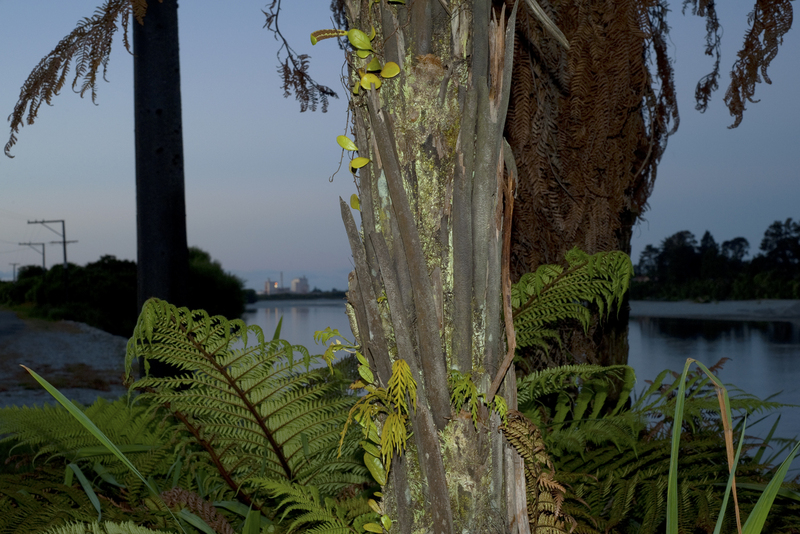 The ponga (tree ferns) are iconic for lowland Taranaki, a reminder of the high rainfall the region receives. The pa is relatively small but has a large terrace of old cultivations on the northwestern side, included in the historic reserve. Despite this pa being very well preserved and easily accessed, its history is virtually unknown. 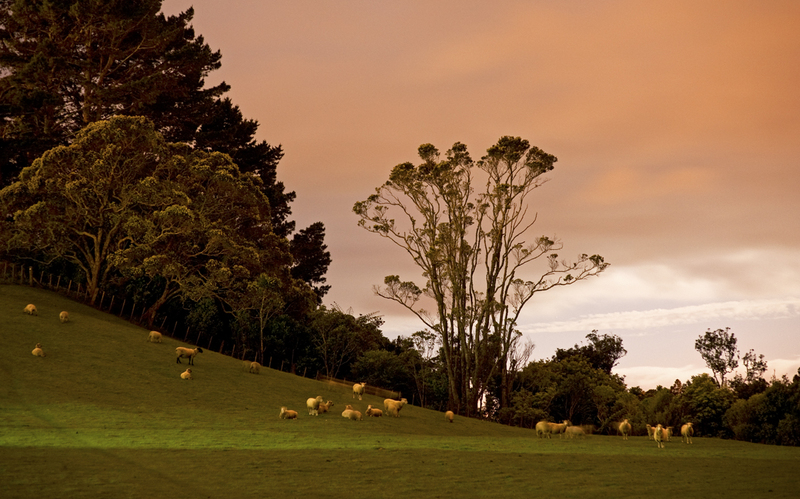 Old pa are a strong feature of north Taranaki but as they get little publicity they are largely overlooked by visitors. Magnificent Koru Pa, at Oakura, would be the prime example. A solid (and chilly!) southwesterly was blowing that night, but the clouds are surprisingly static for a 30 second exposure – helped of course by the wide angle lens. Light balance was set on Incandescent, which brings out the blue of the sky while reducing the heavy orange of the sodium street lighting. The aperture setting ensured a good depth of field, not usually a challenge with a wide angle anyway. I was delighted to see cows in this paddock, unoccupied on my earlier visits to this quiet locality in north Taranaki. 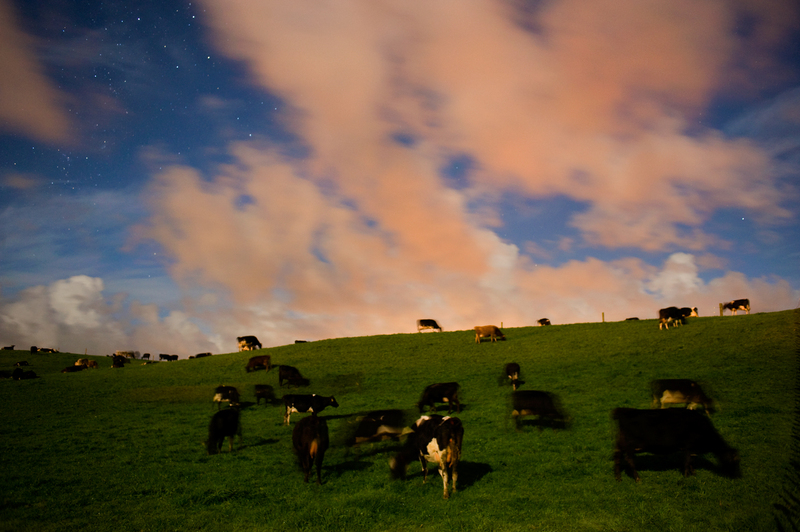 The cows were grazing in the moonlight but at a suitably languid pace, so the ten second exposure managed to capture their essence. The gentle slope is on the other side of the road from the Motunui petro plant mentioned in my previous post. The contrast from one side of the road to the other – industrial to pastoral – is remarkable. 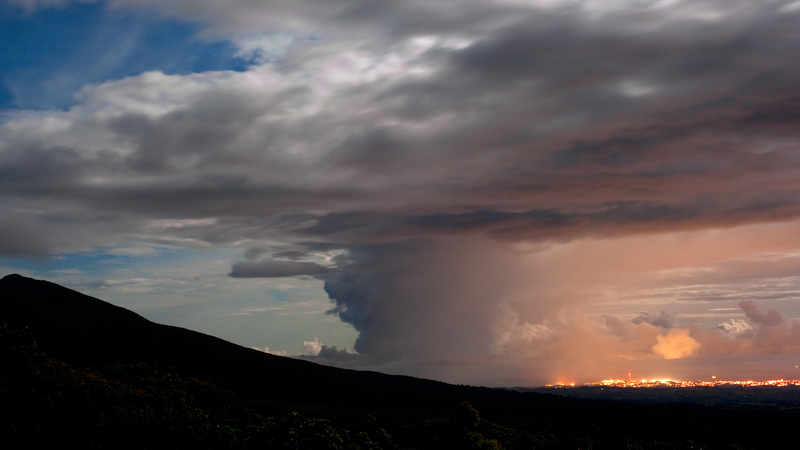 The bright industrial lighting from Motunui colours the low cloud nearby (thus the more distant clouds are unaffected). Low cloud on city margins will also colour up with moonlight photography, and over metropolitan areas the extent of low cloud tinting can be quite marked. Interesting landscapes can still be produced under such cloud cover, especially if there’s a full moon above it all. A shorter exposure would have better minimised cloud and animal movement for this shot. However, the wide angle lens gives better definition and depth of field at f4 than at the maximum aperture of f2.8. The warm tones of moonlight on the scene (clouds excepted) have not been adjusted. Moonlight has a lower colour temperature than daylight, so if we want to a result closer to how the human eye sees moonlit landscapes then Tungsten is a better choice for colour balance. A view of Nelson’s southern suburbs at low tide, from the cycle trail near Best Island. A haze of wood smoke lies over the city, as does the light trail from a plane. The whitest lights are those of the airport runway. 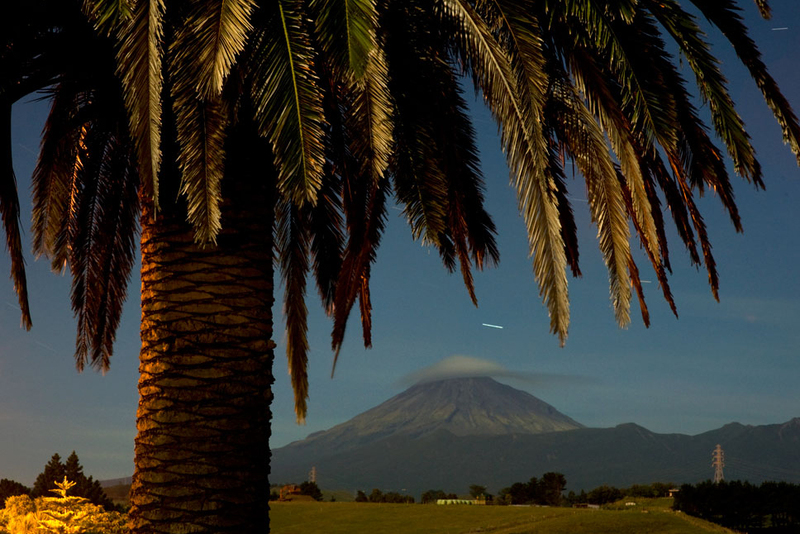 The distant hills mark successive earthquake upthrusts over several million years. The inlet is slowly filling in, but that might be another million years (what a fabulous time lapse that would be, if we could see it). The brightly lit fringe of sea grass made focussing a breeze, especially with a fast lens like the f1.4 Nikon 85mm. This lens is a terrific piece of glass, yet so heavy to cart around! The level bike path gave an easy placement for my tripod, and not a cyclist was seen. The evening’s work was less pleasant with the southerly breeze, although some shelter came from fenceline shrubbery. Waiting around for long exposures on cold winter nights (they are all cold, bar those with northerly rain) makes you keen to reclaim your creature comforts. 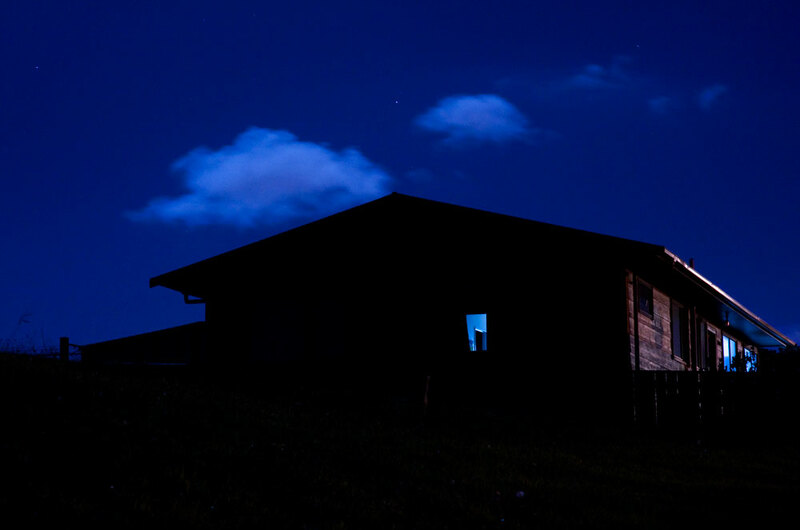 Although I was not so far from an occasional passing car (Best Island has over 30 houses), what generally surprises me in these semi-rural settings after dark is the ambient noise. This comes mainly from heavy highway traffic but sometimes from nearby industry as well. 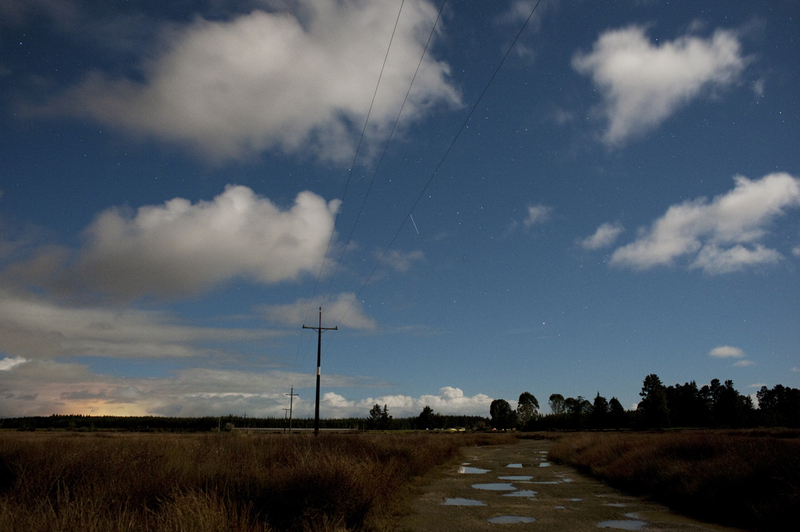 Rural quiet may well exist somewhere locally, but on any still night on the Waimea Plains it seems in short supply. 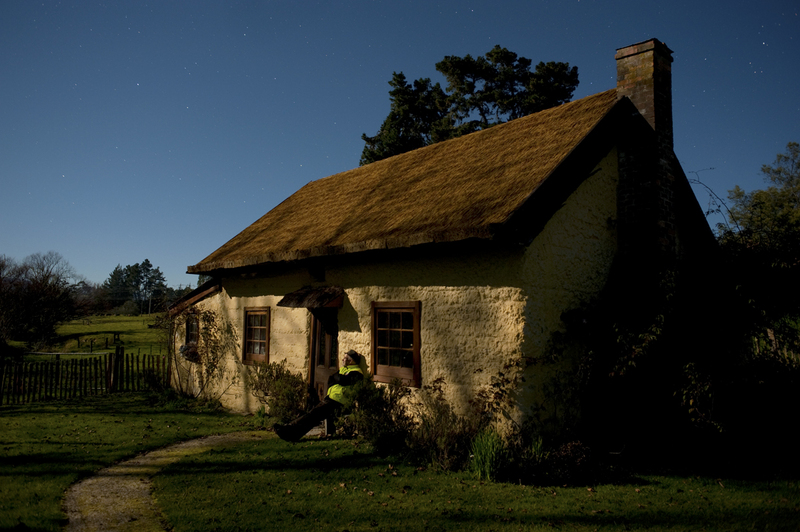 Here I am, gazing at the moon in the Nelson countryside, beside a cob cottage built in the 1850s. The cottage is a restored one, complete with a thatched roof, on George Harvey Rd, Upper Moutere; it’s available for public visit. All I lacked for this occasion was a rocking chair and a cob-pipe of tobacco (or whatever it is that people smoke these days). The long exposures of moonlight photography are good for adding yourself to the frame, and for creative experimentation – you don’t even have to hold still. Clearly not a selfie held at arm’s length, this “self-portrait” required only a glance at the seat by the door (as to where to pose), plus a longer setting of the self-timer than the usual 2 seconds. A younger photographer might adopt an energetic pose for such a half minute exposure, but I have simply assumed my natural position. Six months on Instagram shows that putting yourself in the shot is an art-form on its own; there the figures are typically centre-foreground, lithe and young, female and beautifully styled. I’m out on all counts, and my fashion sense is summed up in the safety-yellow of the warm vest I am wearing. No matter, as that happens to be a thoughtful and useful gift from my good wife. 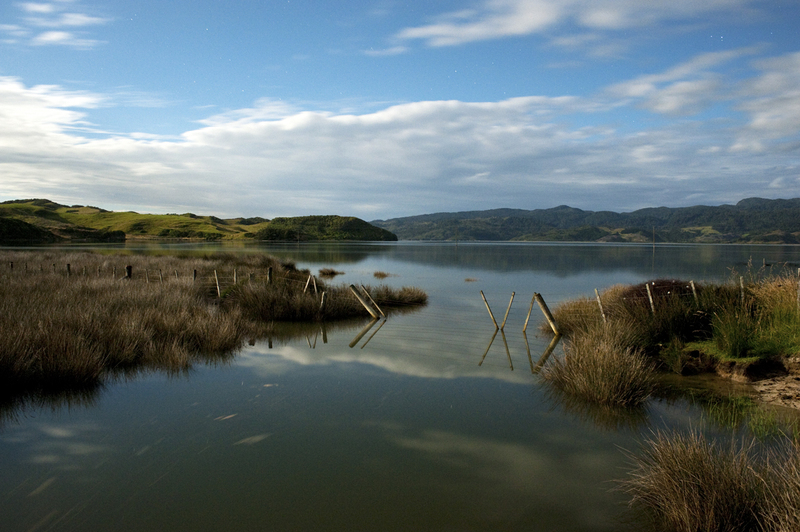 The Whakatu marae sits on 10 hectares of reclaimed estuary next to Founders Park, in the city. It is hub to six iwi: Ngati Koata, Ngati Kuia, Te Runanga o Toarangatira, Ngati Rarua, Ngati Tama and Te Atiawa. I took this scene because the entrance-way nicely mirrored the meeting house profile; the roofline vents also added interest. 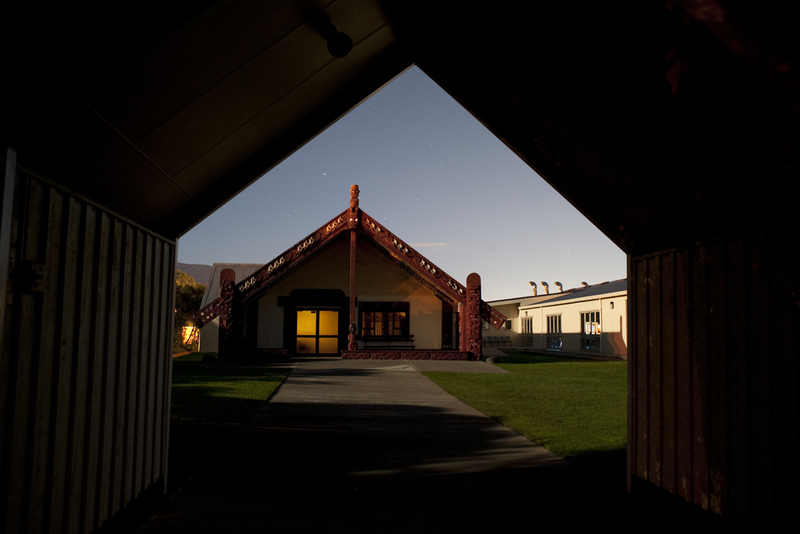 The light within the wharenui (Kaakati) was very dim, but that was just what was needed to balance with the moonlight. 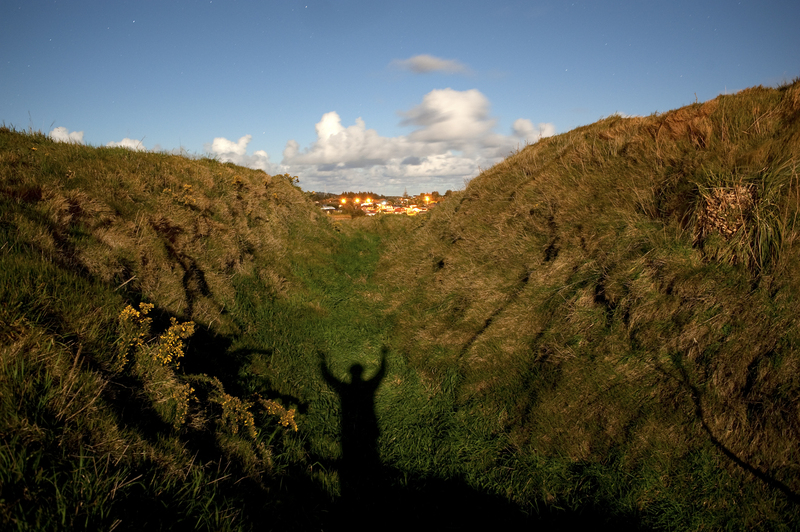 In moonlight photography, and particularly in colour work, shadows are a special hazard (pictorially speaking; in safety terms shadows can be trouble too, but that’s another story). The more your frame is dominated by shadow, the more care is required for an effective composition. Here some detail is still visible in the battens of the entrance-way, but beyond, in the middle ground, there is nothing – although as a central mass the deep shadow offsets that of the wharenui quite well. Probably a better image would have been achieved an hour later, when the moon was higher in the sky. The tripod was propped up against a wire-netting security gate, with the lens poked through. Long exposure photos are a bit like a duck swimming, in that all the effort to get somewhere is unseen; then again, shooting for a full night effect is hit-or-miss because of the variations in screen and monitor illumination – even the angle of view on a laptop makes such a difference to the effect. 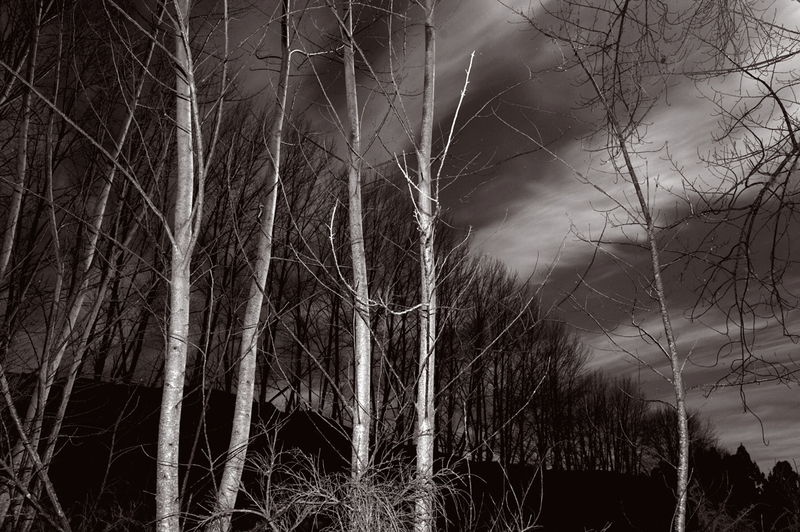 This moonlit scene in Garden Valley Rd, near Brightwater, demonstrates a work in progress in night photography. It does not meet my own standards for a successful image, but it has some teaching points, so I publish it for that reason. A good composition can offer a “look-through” sense of depth, when the elements are so assembled. 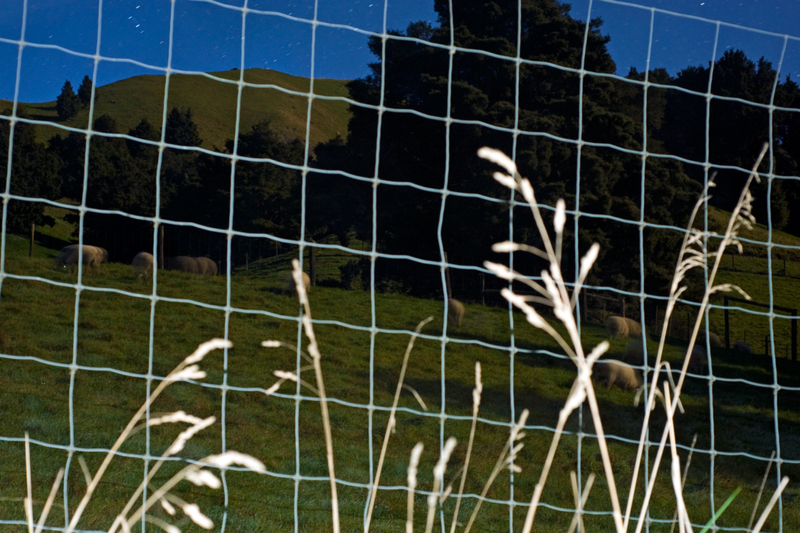 Here the look-through is supplied by the fence netting (always for deer, in New Zealand), while the foreground stalks contribute scale and perspective. All very simple in theory, but (as usual) practice shows otherwise. This is work-in-progress because of the problems referred to. 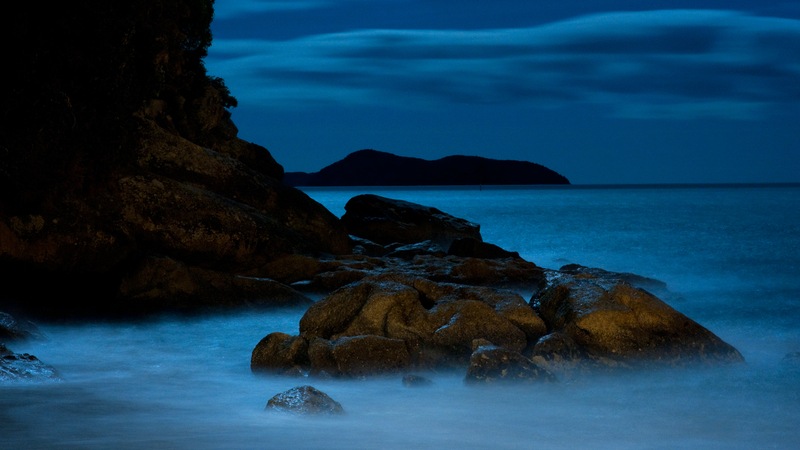 Moonlight photography is challenging: the work is hard and the hours long – and you don’t even have evenings off. Of course these are all First World problems, and exactly what makes a great exposure – when you get there – all the more satisfying . A Good Friday illumination, though not an epiphany, from an unexpected source. A subdivision being so close to where I was staying, it was a simple matter to put on gumboots and shoulder tripod for the short walk to the hilltop, where a house was under construction. As building sites are prone to pilfering I didn’t want my intentions mis-interpreted, so when vehicle headlights suddenly appeared in my frame I did not know what I was in for. However I was set up on the less public side, and whatever the purpose of the lingering lights and long-running engine, my presence was apparently undetected. I wear a warm, high-vis vest (thanks Narumon) on all my evening outings, for safety’s sake. Generally I avoid using flash in residential areas (discretion vs valour) and have rarely been challenged by suspicious onlookers. On moonlit excursions I mostly stick to public spaces or to holiday places on farms; looking back on work from the last few years, I see my trespassing has been confined to college farms, new subdivisions and golf courses. Diagonals and limited focus are not common elements in my compositions, and I would have liked a more distinctive shape for the tree, but serendipity should not be denied – namely the headlit timbers – and I am obviously susceptible to a good, unclouded mountain. 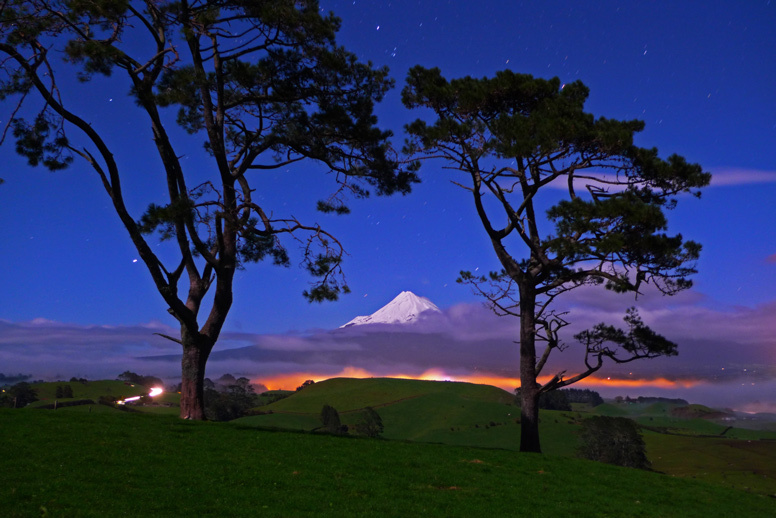 Mt Taranaki is an immediate anchor for any former resident returning to the region. My visit to Taranaki last month offered no new opportunities for creative photography, but I have just re-discovered this unusual image, taken with a telephoto in our back garden (then) in Westown, New Plymouth one early spring. A power cable mars the lower portion (too hard to retouch!) but the main interest is the sense of depth in the clouds. The trees and the lower cloud are illuminated by street lights, but not the upper cloud. Two stars are visible. Although I took many further photos at different settings (some too slow for the cloud movement, others at similar shallow apertures) the formation quickly dissipated, along with my evening’s hopes. So much of long exposure work is like the dilemma at the printers: do want it fast, good and cheap? Choose two only. 85mm lens; ISO 2000. 2.5 secs @ f2. This is the very first frame from a simple composition, one that I was subsequently unable to improve on. It is taken from Arthurstown, on the opposite side of the river, where protection works give an unobstructed viewpoint. 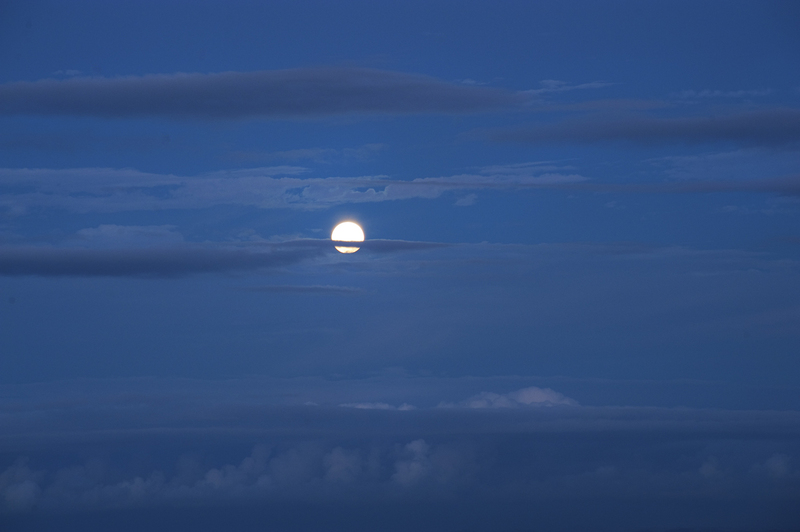 Cumulus clouds by the full moon are appealing but are not that common; the main problem in photographing them is to stop them from blurring in the exposure required – that is, one which retains an adequate ISO and a sharp aperture setting. 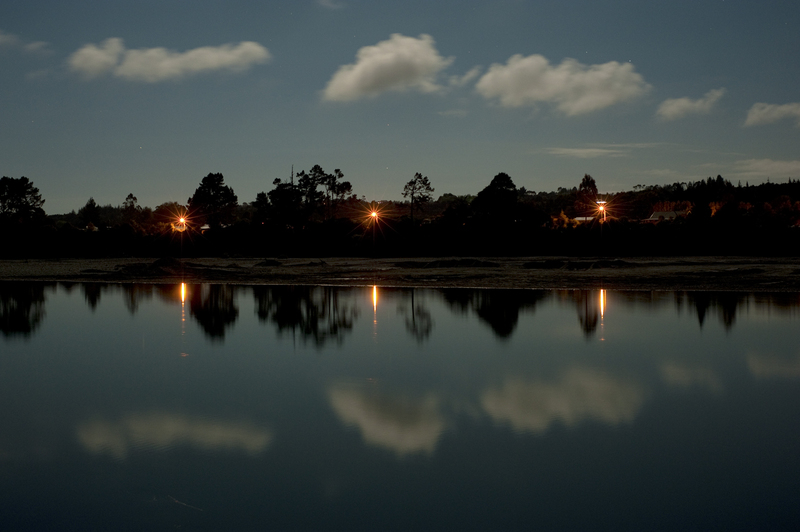 The three reflections and street lights are what made the scene worth recording, but the interesting thing is that the lights of the town aren’t reflected under the clouds, meaning they were higher and further north of Hokitika than this viewpoint suggests. The further west or south you go in December, the longer the day (and the twilight), especially if you’re heading down the South Island before the solstice. 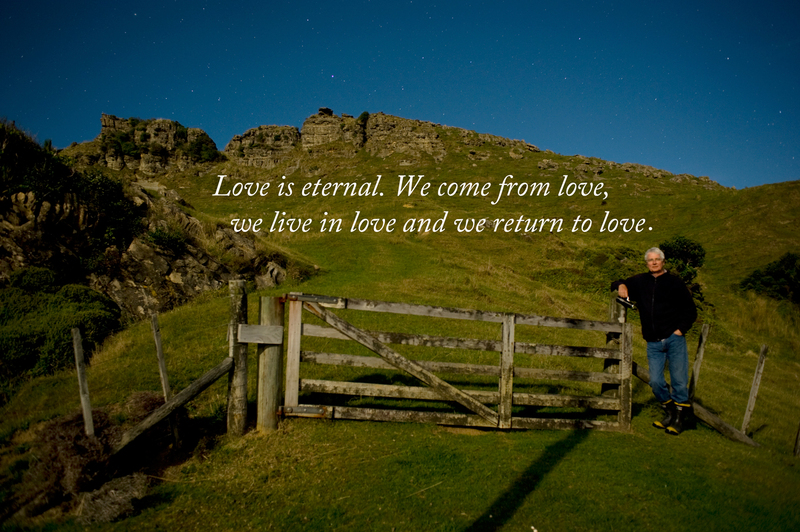 We noticed this on our way to the Catlins (South Otago), via the West Coast. Although summer solstice marks the longest day, not many people know the earliest sunrise precedes the solstice, while the latest sunset follows it, by some days. We began our trip with a full moon approaching, but sad to say, neither our travel arrangements nor the weather were conducive to moonlight photography. However, we had pleasant digs at Arthurstown, right by the Hokitika River, and this view back towards the town was a short walk from there. I had hoped to feature the distant dairy factory more prominently by moonlight, without knowing that at night the place would be brightly illuminated, swamping anything that moonlight could offer. 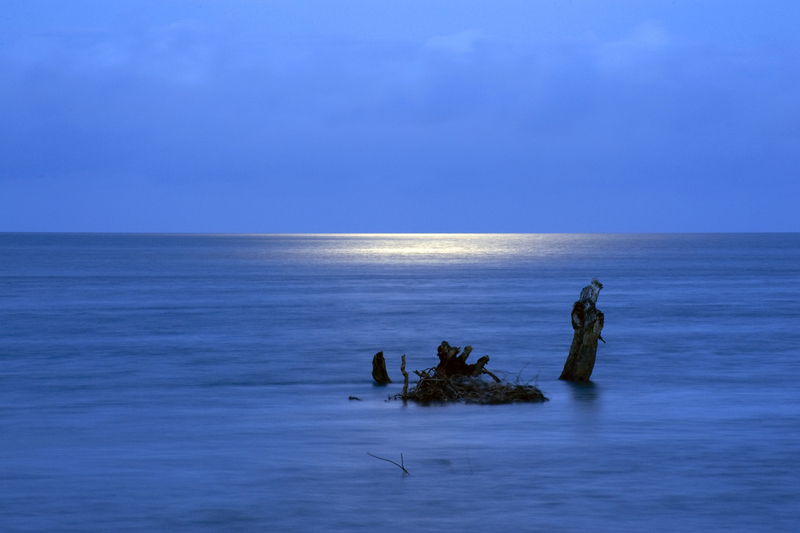 Moonlight is so feeble that it generally competes only with distant artificial lighting. Balancing the flash at close range with the ambient twilight can be troublesome, especially if depth of field is also important for your composition. I used f16 on my standard lens here, overlooking the optimal f22. Extra lighting is essential for this type of photo; although it doesn’t need to be by flash, I find it highly convenient. Another sample from my 2018 New Zealand calendar, this one is for May 2018. 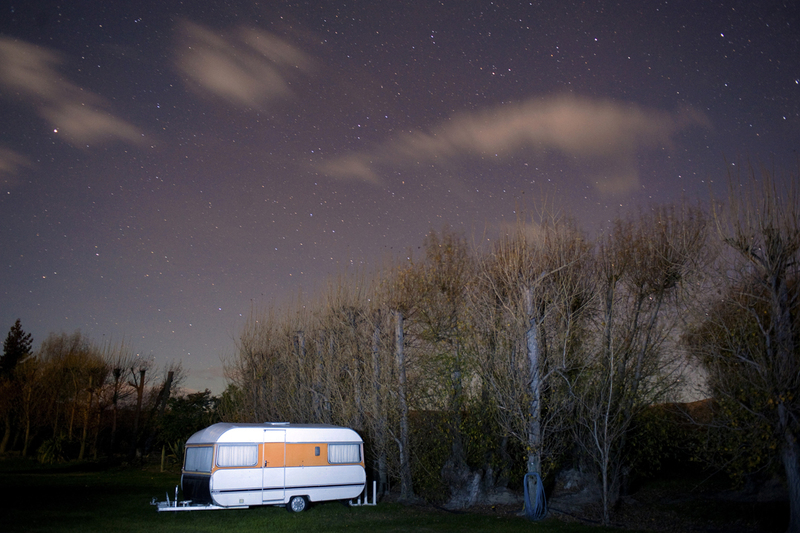 The holiday park at Kurow was decidedly off-season on the cold autumn night that we stayed there. A bitter, blustery wind was blowing but I coated up and left our snug cabin with tripod and gear, determined to make use of the wan moonlight in such an interesting setting – and was then pleasantly surprised to find that down by the river was quite sheltered. From the several hours I spent on the terraces, covering many angles on the deserted camp, this pic has emerged as a favourite. A second, quite different scene from this frigid outing also features in my upcoming Perfect Evenings photo book. Monday 2nd October is the last day for my extra special prices on this 2018 calendar, post-free for NZ & Australia. There are still about 20 left – so why not purchase and enjoy?! This is a sample illustration from my long exposure Perfect Evenings 2018 New Zealand calendar. 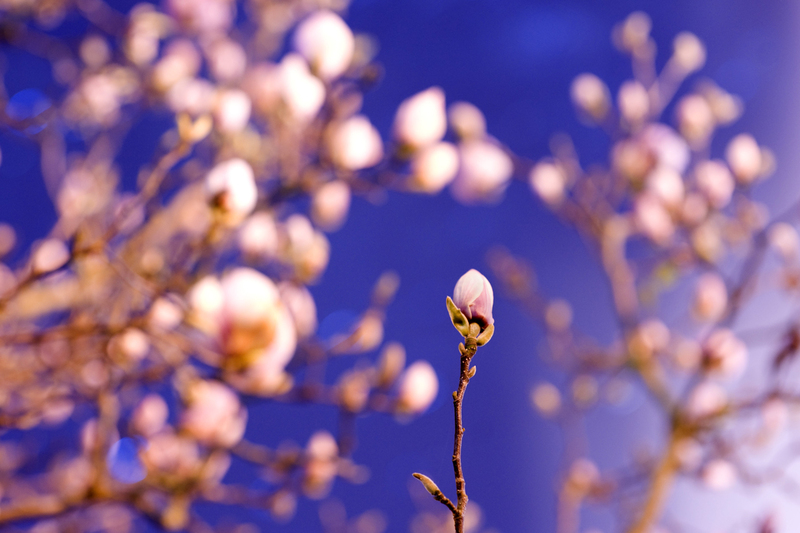 Magnolia flowers are a welcome sight in the southern spring, appearing from July to September, depending on the species and local climate. By moonlight or street light they are even more luminous and lovely than by day. Printed in just a small edition of 125, most of my calendars have now sold at the special early bird prices quoted in the last post. The three for $30 deal and 5 + 1 for $60 have been very popular. There’s obviously good interest – not to mention good sense – in having giftable items on hand well before the usual rush, especially when so many New Zealanders are taking to the air (and the road) and require packable items for their calls and hosts. 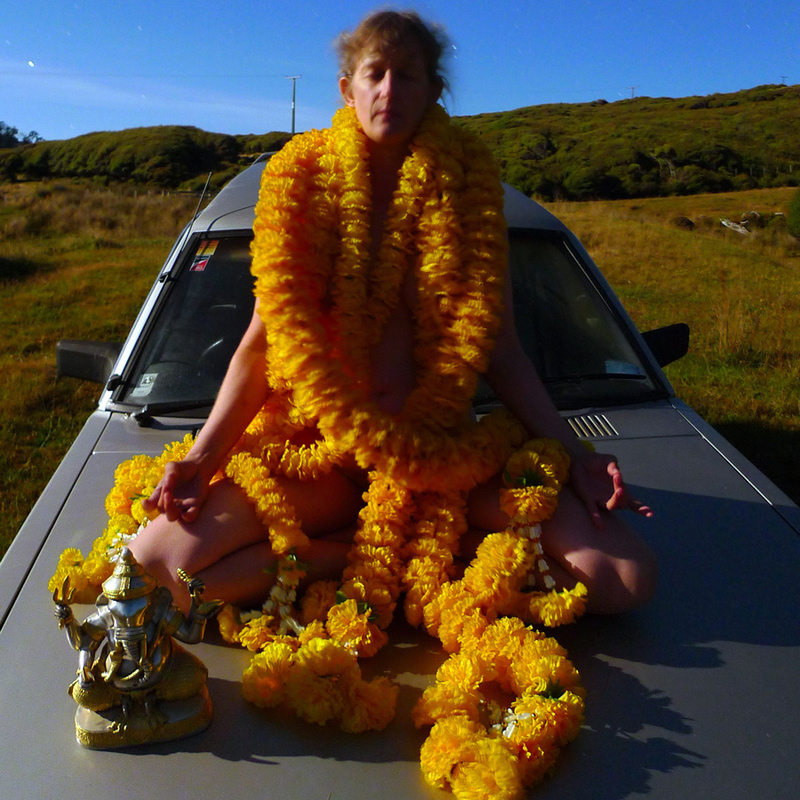 All prices are post-free within NZ and Australia. My best-ever, these prices are current until Monday 2nd October, and will not be repeated. By that time the entire stock will probably be spoken for, and any reprint considered will have to be at standard prices. These will still be good value, however, with various extras offered, in addition to the photographer’s own prompt and personal service! The difficulty with low angles in night photography is mainly in composition – craning the body to see whatever’s visible in the viewfinder, after steadying the tripod, set as low as it can go. In long grass there’s also a lot of levelling and lining-up. Also necessary after plenty of rain is something to keep your bended knee dry, although in this case the matted grass itself did good service. Using flash to highlight close objects is unpredictable but I was fairly sure the stalks would overexpose – the desired effect. 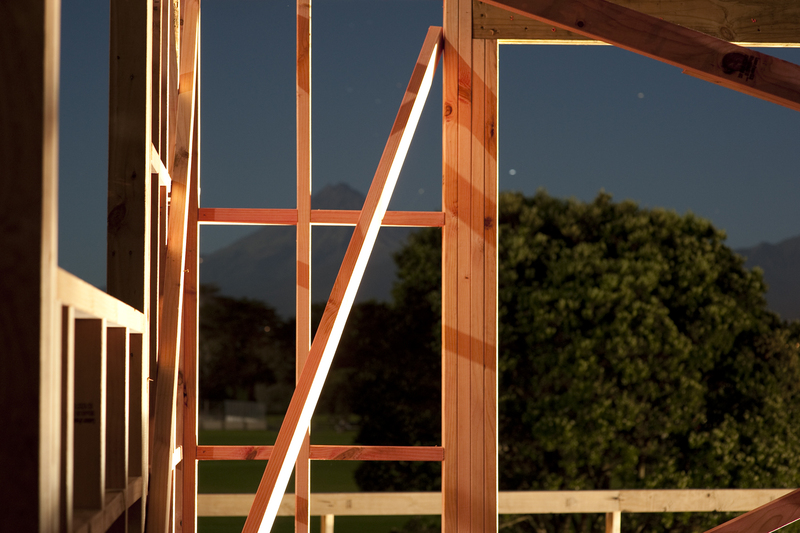 Mixed lighting is not difficult by moonlight, as long as your extra lighting is not too bright, or is only brief. Rating just 2 watts, moonlight is easily swamped by street or house lights. Puffy whites, AKA cumulus clouds, beloved by photographers, decorate otherwise blank skies and keep them interesting – even night skies, which are much lighter by moonlight and less populated by stars. The unusual thing about the scene above, taken well after dark, was the narrow “window of opportunity” for it. The cloud cover was low and pervasive, and the heavens opened up for only a few minutes the entire time I was out. Peak moments! The location is actually landward of Rabbit Island (the bridge is visible here) but north of the stopbank and only marginally above sea level. 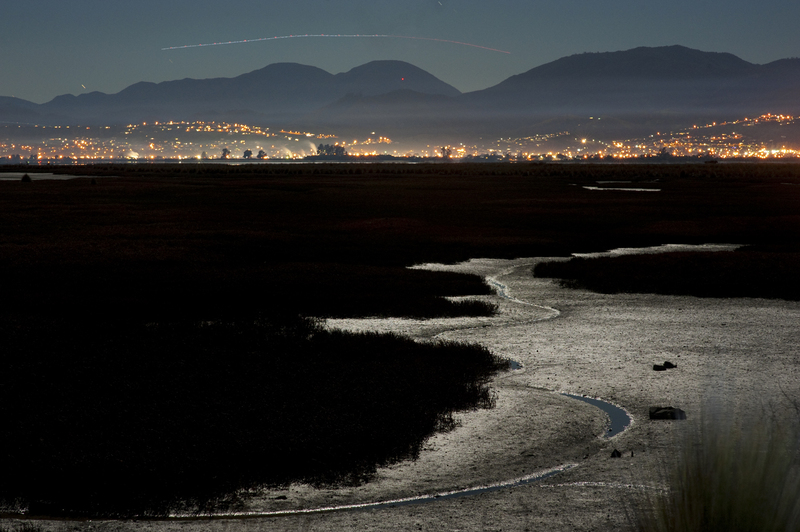 Puddles from recent rain add to the texture of the land; the lights of Mapua brighten distant cloud. There are so many hard-to-repeat factors affecting any sense of achievement on my moonlight forays, but as long as it’s not raining or blowing something can usually be made of any new location. What never applies, though – unless it’s on my very doorstep – is “Oh I’ll get it next time”. Things are never quite the same, next visit. A family trip to New Plymouth last week coincided with a full moon, but alas, I had flown one stage of the journey, so arrived without a tripod. 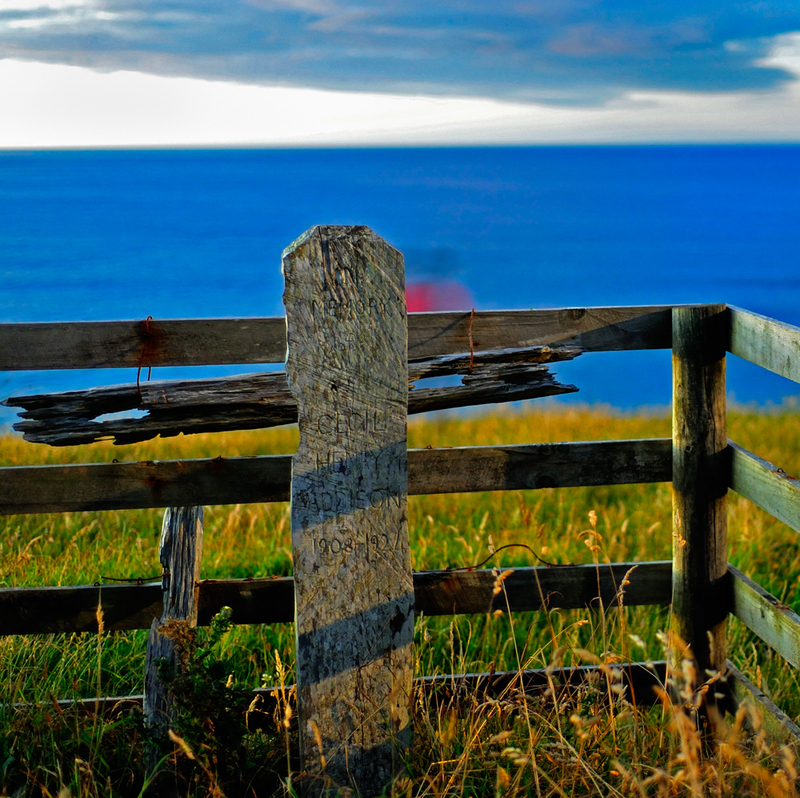 From a fence post alongside our accommodation I took two frames which have stitched up nicely. My other steady-state improvisations were not successful – trying the camera on a patio chair (awkward to get the right angle) and on a free-floating fence batten (lingering vibration). Even on the fence post the placement was precarious, so I hung on to the camera strap. I did not think there was much going on for the left frame until I noticed the sleeping horse and the slight blush to the low cloud (which enveloped the area for days). The neighbouring property was interesting for its rustic buildings, particularly one which leans precariously over a slope. Although urban and sophisticated, it appears these sheep were only used to the glare of the neighbouring polytech hostel, and not moonlight paparazzi. The venue is an open space tucked away behind the city cemetery, and between WITT and Te Henui walkway, in the vale below. Small Maori pa abound in this vicinity and their reserve status contributes to having this unfrequented, pastoral scene in the city. Here night-time photographers can pursue their craft with a pleasant sense of calm and solitude, despite the incidental noise from the hostel. The clouds reflect city lights; the light beam is wastage leaping the boundary fence, offstage left. How very different this looks by day! Moonlit Mordor, from Arawhata Rd, Opunake. 8.57pm, 25 April 2010. My 36 Views of Mt Taranaki has sold out. The book used mainly daylight images, just to prove there’s more than one string to my fiddle. Nevertheless I continue to find twilight and night imagery more interesting because of the larger creative possibilities. This is a Lumix LX3 image, converted from colour: a desolate, snow-free mountain, as seen from from a desolate sector of the ring plain. In contrast to the more settled appearance of the other side of the mountain, this is rougher, harder country. 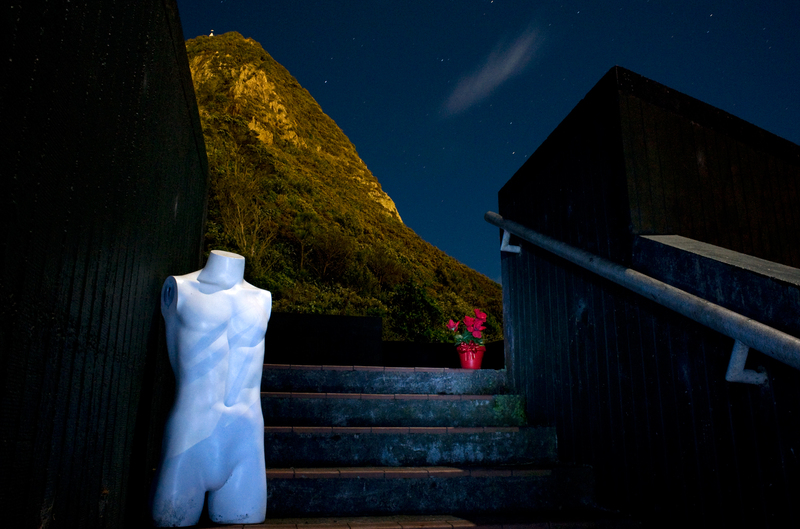 On a personal note, this is a belated coda to my Taranaki series, as this year we have returned to live in Nelson. Despite the hiatus I have been occupied in reviewing my extensive transparency collection, compiling a second book on evening photography and putting together a 2017 calendar, one without a volcanic theme. But about that, more shortly. The city by evening can have plenty of light for night photography, either diffused from street lights or reflected by low cloud. So if your moon disappears from view, look for other possibilities. In this case, an unusual streak of light came from student quarters just over the fence, while the cloud is coloured by sodium street lighting. The pasture adjoins a historic reserve (an old pa site to the right) above Te Henui Stream and borders the city cemetery on the left. This evening I had the place all to myself – except for the sheep. Two telephoto images make up this panorama; double click on the scene for a larger view. 85mm; ISO 500 / 1000. 30 seconds @ f5.6 and f8. Usually I try to avoid subtlety, but these two images a short interval apart demonstrate the use of flash. 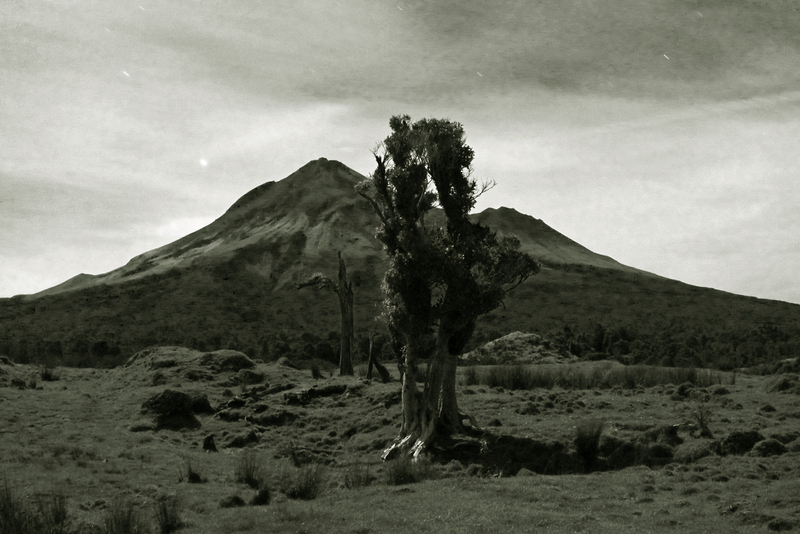 In the scene above – the steep flank of an old pa above the Te Henui in New Plymouth – the flash has a fill-in function but also highlights the central tree trunk. The image below gives away my vantage point, one of the two new (2013) footbridges on the walkway. Here the flash illuminates the railings but is not strong enough to highlight the background. It’s a startling shot but I prefer the straight one above. A perfect spring evening, it was quite still in the sheltered valley, with the rising moon waxing at 90%. 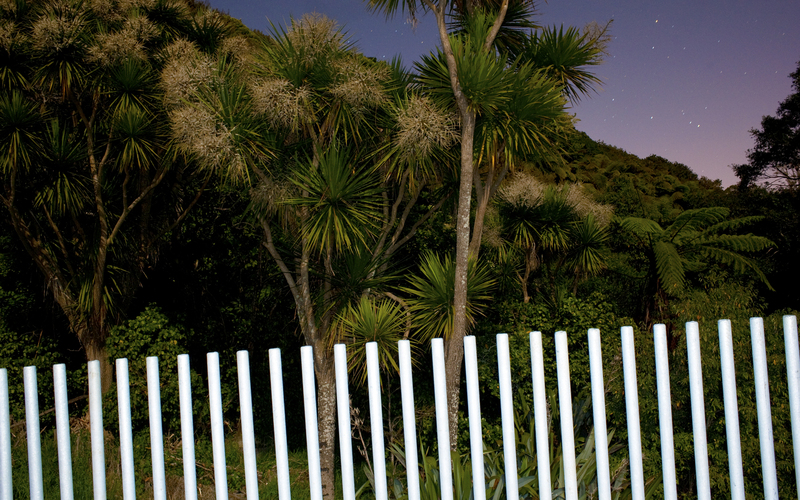 This was our most enchanting pause on the walkway, one open to the moonlight and enhanced by the heady scent of the cabbage trees. 28mm; ISO 500 & 1000. 30 seconds @ f5.6; @ f8. A futile gesture in the top fosse of this stronghold, conspicuous in New Plymouth’s western suburbs. The pa is high but I was sober – indeed the chill sou’wester was sobering, so a hip flask would’ve been welcome. The pa’s history is not accessible online and as it is barely mentioned in the standard works on Taranaki history, it was likely long abandoned by 1828, when the first Europeans arrived at the Sugar Loaves. Its preservation was only assured in 1989; today the pa overlooks suburbs at every turn – but the views are great. It is an impressive sight for visitors, although actually little visited. 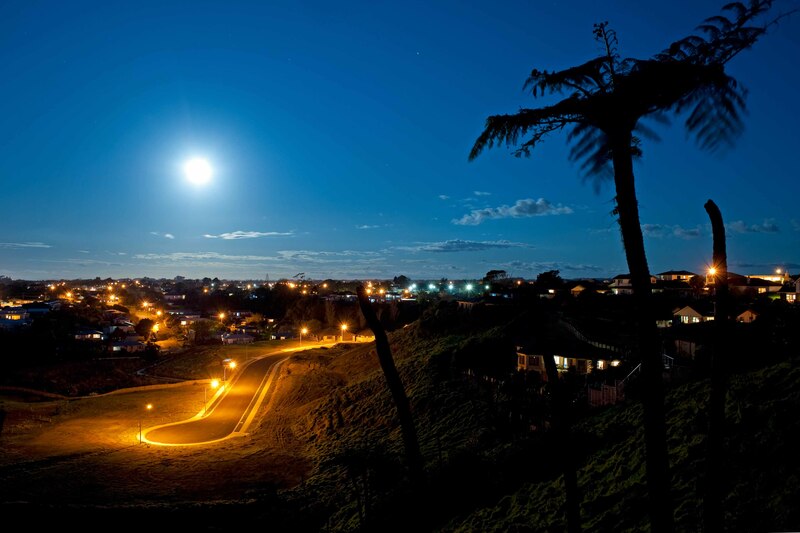 In Taranaki a calm, clear night with a waxing moon is not to be ignored – but rather than drive around, I sometimes prefer to walk out and see what turns up, as pastoral peace on the city margins is not too far away. This two-frame panorama of contented cattle sums up my evening, although my cold, wet feet also made themselves felt by this point. My new photo book on Mt Taranaki will feature day and night photography, but only in standard frame images – no scope for panoramas! Double click on the image for a larger view. 50mm, ISO 250. 30 secs at f4 for each. 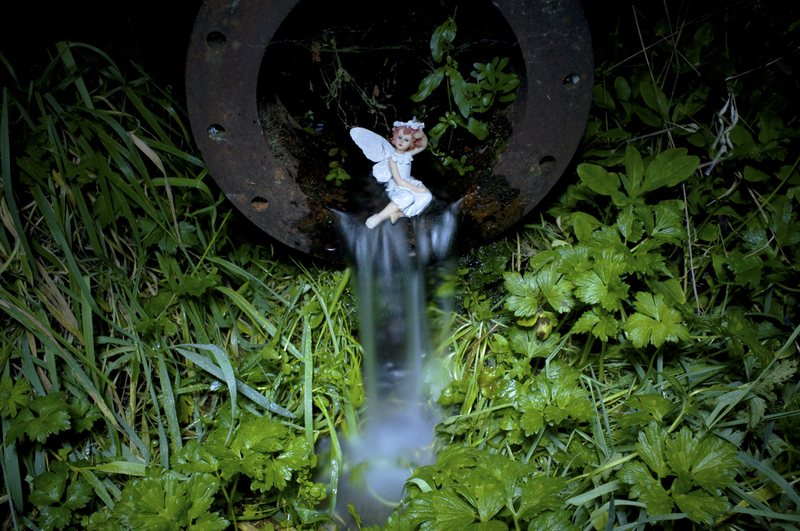 1116 Rivulet of time: Dreams of a small figure. This uncommon scene is a reprise on my earlier visit, also in May (2009), with the Holy Virgin. Although we’d had some rain before this secular occasion, my obliging figurine held her position well on the edge of the abyss, and so my only task was to administer the correct amount of torchlight. The location is just below the old weir at the Brook Street reservoir, Nelson. A waxing moon had cleared the manuka above, but moonlight here is lost in strong LED torchlight (the moonlight was not lost on my hi-vis vest, however, and my daughter quickly found me once the nearby comfort of the car had palled). LED lighting is quite cool, like daylight, so I’ve added some warmth in post-processing – the photo equivalent of a teaspoon of tumeric in the dinner pan. I admit to some anxiety parading a mannequin in a public place late at night, being too old for the art student look, so I was relieved to have this popular venue to myself for the duration. The torso was a gift from my daughter, intended as offset to a female mannequin she admired in one of my old photos. The pot plant is 100% artificial too. Moonlight and port lighting (background) are supplemented with torchlight on my two props. The steps lead to a brutalist viewing platform below Paritutu, the steep volcanic remnant which dominates the local coastline. A cloudlet wandered over, to complete the composition. Not recommended for biscuit tins. I believe this is more biscuit tin than chocolate box, which is an elevation of one step in the Brewster Heirarchy of Fine Art. At least it is free of ferns and magnolias. From notes made some years ago I see that the three levels above “Biscuit tin” are deemed as Classic, Iconic and Sublime (also known as “Shock & awe”). In approbation these 5 levels correspond to good, very good, excellent, fave and absolute fave… Moonlight reflections have the same exposure value as clouds typically – that is, higher than city glow, which is minimal here. With a telephoto you can reach into a well lit landscape even when from my own position the moon was completely clouded. The long shutter speed has given clear images of the boats, which surprises me as they usually blur with sea motion. 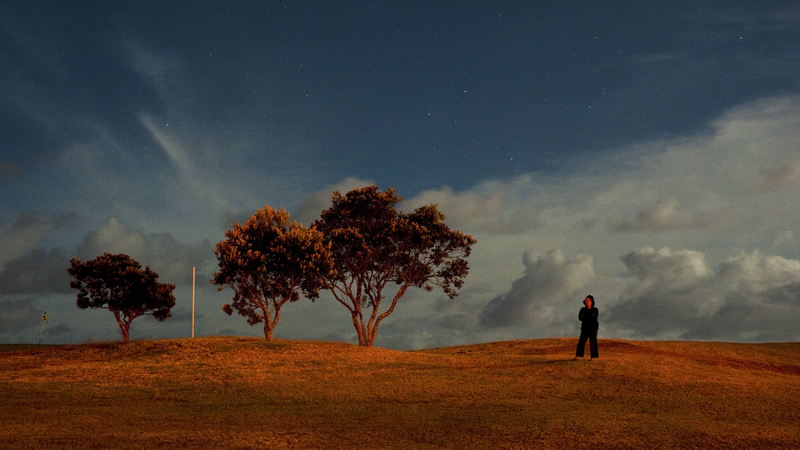 A twilight moon always rises over a flat landscape – in lighting terms, at least, after sunset. Two strong aids to composition, much to my liking, are silhouettes and clouds, and only these are a match for the moon’s brightness as night begins to settle. A variety of clouds is always welcome, but too many at once and the moon will be continually ducking in and out of view. This deliberately simple image – very much taken with digital wallpaper in mind – records another routine cosmic occasion, as our fellow traveller looms into the gloom, ready to light a summer’s night [applause]. In post-processing I chose two frames which looked doubtful for the auto program to handle, so was agreeably surprised to have them adroitly merged, despite the likely dislocation of fast-moving clouds. I had stopped these on each frame with short exposures; faster shutter speeds were possible but only at wider apertures, which would sacrifice depth of field. 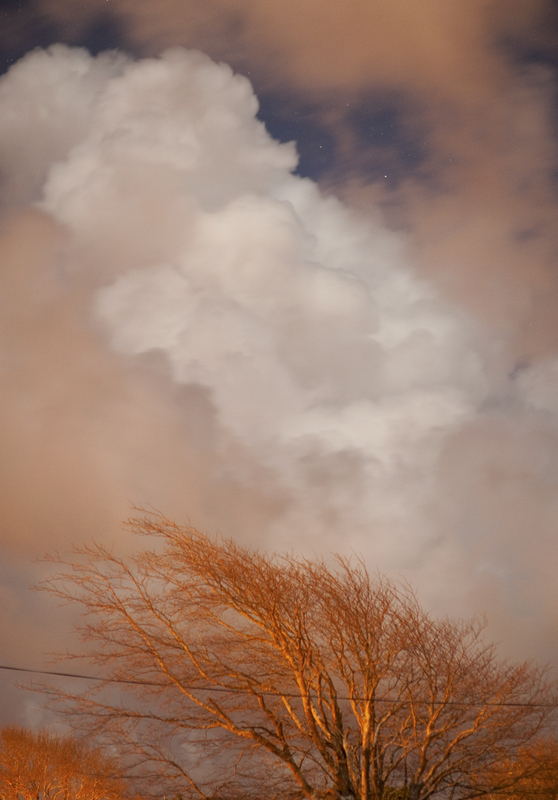 City lights fill in the moon-shadow on the left and highlight the macrocarpa trunk and offshore clouds, but to the right is sodium-free, being leeward of the ridge. Human silhouettes would add further interest – one day I must duplicate some people by having them move from one frame to the other in the pause between exposures. Double-click on the image for a closer look. Sited as it is on old dunes, the golf course has some pleasant undulations; two stiles on the street suggested a ramble. A potential problem for moonlight photography was the row of sodium nearby – moonlight can’t compete with city lights, but when they are at a good distance some balance can emerge. The two light sources are also far apart in their colour temperatures so an either/or selection must be made on your camera setting (actually not quite true – an intermediate choice is possible, but not as a preset). In this case the warm sodium glow was acceptable and a higher colour temperature ensured a natural look to the clouds. I asked my wife & companion Narumon to stand on the rise and she held her pose very ably while the clouds moved into position. The image has been cropped to 16×9 and now graces my own screen as wallpaper. 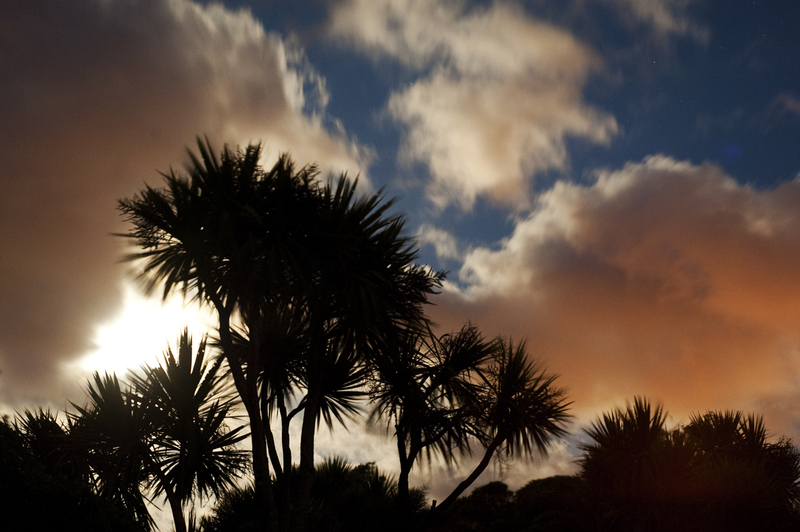 For the night photographer New Zealand has some distinctive silhouettes to add to sky & cloud studies. 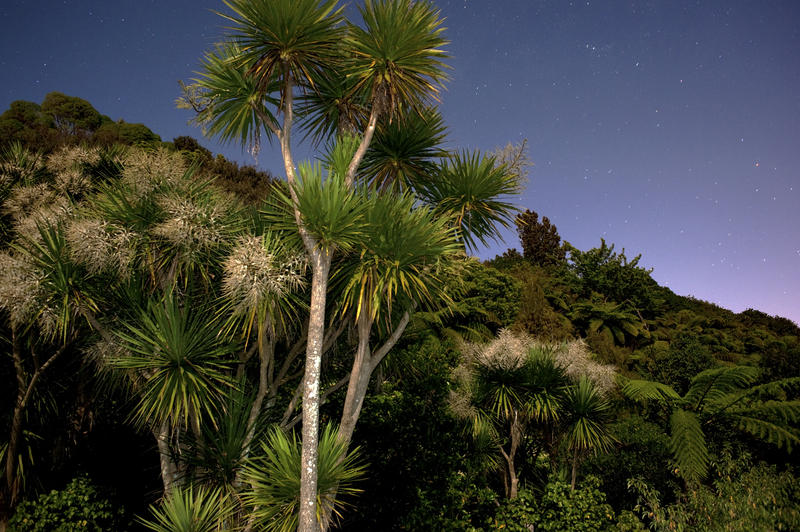 Shown are cabbage trees (ti kouka) but tree ferns, pohutukawa and the nikau palm also come to mind. Puriri, young kauri and kahikatea have great profiles in specimen too. However the usual problem is to find one or several on their own, handily arranged for your viewpoint. Here the sky is moonlit blue while the low cloud reflects city lights to striking effect. Jupiter and Venus for the top corner were unfortunately not available. I find myself more drawn to formalist compositions as I grow older. They are by no means easy to do, especially after dark. This one surprised me on a pleasant roadside. Intrigued by its depth, I used the last of my battery to highlight the foreground. In post-pro I have discarded the original colour elements, then chosen a brown and black duotone from a long list of possible combos. Digital duotone is “an imaging process that computes the highlights and middle tones in a black and white image, then allows the user to choose any color ink as the second color” (Wikipedia). In print, duotone (or tritone) is the best way to present half tone (B&W) fine art, and also historical photos. 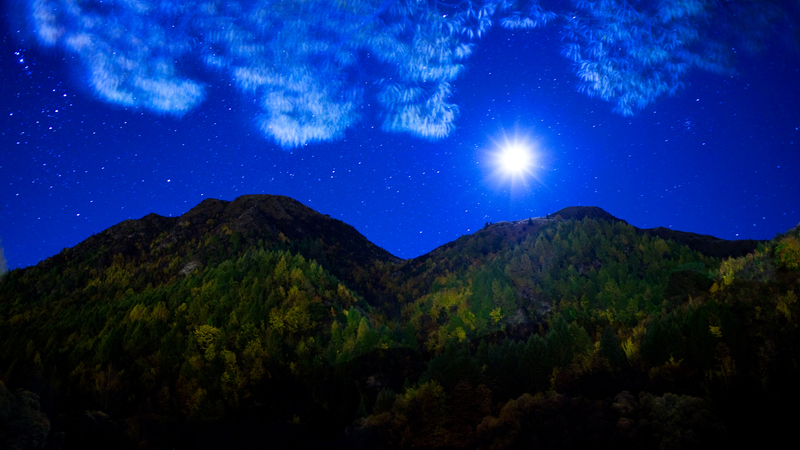 Moonlit clouds – how I know these well, as a pleasant pillow for my head. 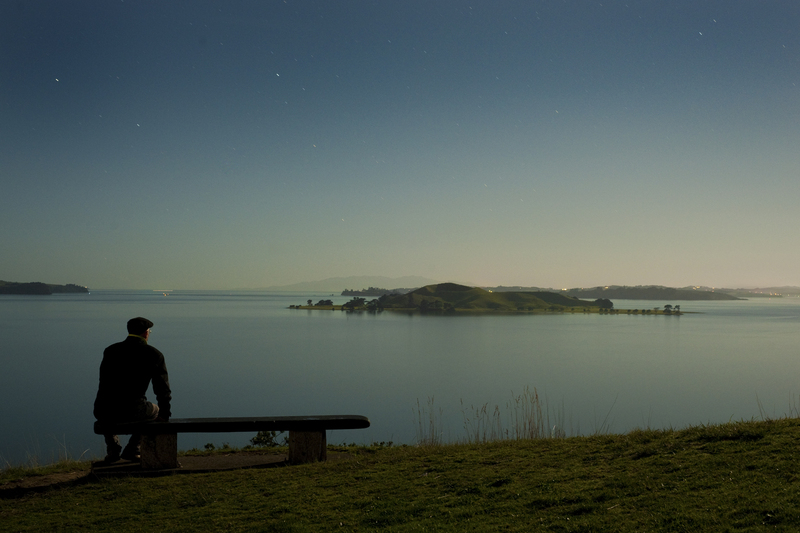 Here’s another practice shot, complementing my earlier Marahau post, in the art of stitching up two wide angle frames. Each was exposed for just 5 seconds, in order to keep the clouds well-defined. 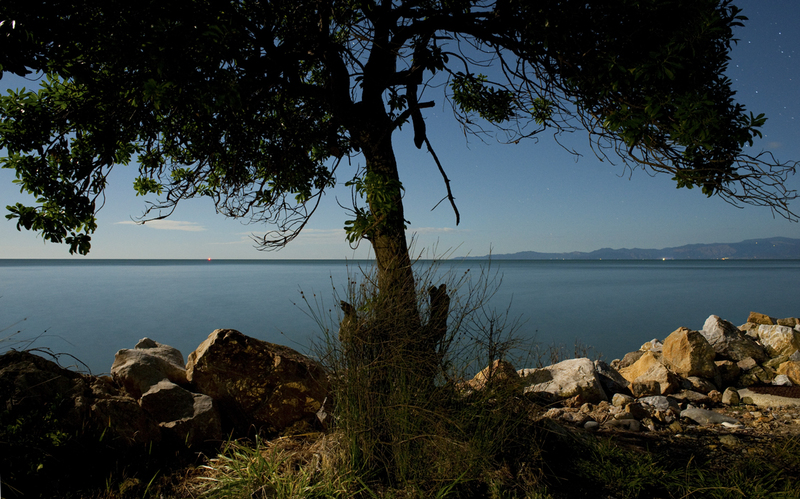 In silhouette are the headlands and islands of Abel Tasman National Park, on the western side of Tasman Bay, Nelson. Double-click on the image to see a larger version. 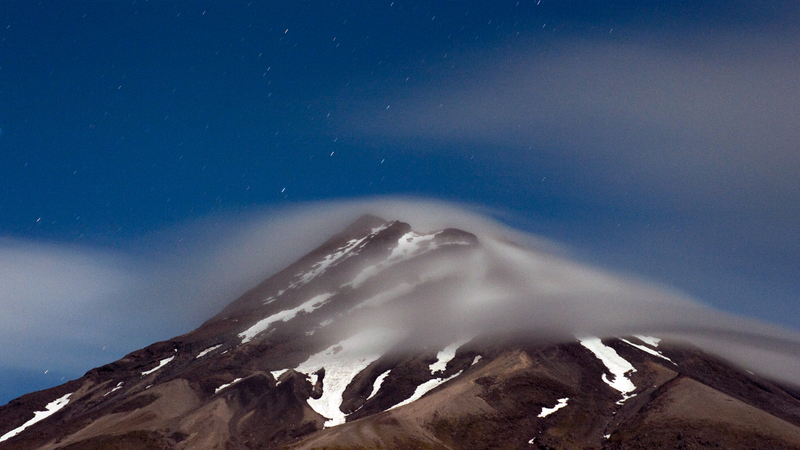 Mt Taranaki is bare of snow and ice for 4 or 5 months of the year; this view from the Blue Rata Reserve is a sandwich of two frames, taken on a full moon evening, the last of summer. The Stony (Hangatahua) is a fast-flowing stream, one prone to flooding with dramatic effect. In shooting for panoramas there are two main hitches: securing enough overlap of the frames (for auto alignment in post-processing), and ensuring a level track in your arc of view, on the tripod. 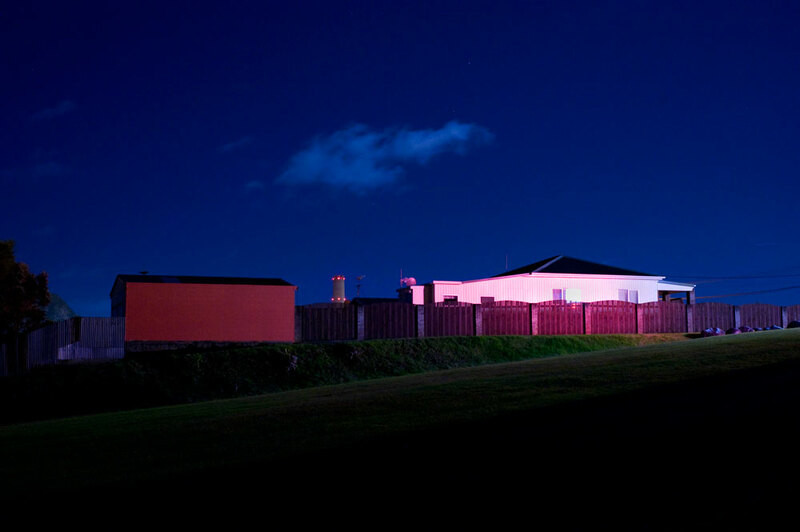 This is the last frame from a series I took from Achilles Point, a suburban vantage point at St Heliers, Auckland. The view is east, towards Brown’s Island (Motukorea), with Great Barrier Island on the far horizon. More a matter of record than any artistic statement, this was the last frame because during the 30-second exposure I heard unusual truck noises. I was unaware that I had parked in a verboten zone, and the Draconian Guard from Auckland Council were preparing to tow my car away. Fortunately I got back there before its wheels left the ground, but this is probably the most expensive photo I’ve taken, and one with potentially the greatest inconvenience. Parking hazards are now added to an impressive list of other challenges for the night time photographer. While the others snuggled down to watch rugby on TV, I ventured out into the cool evening and walked towards the Abel Tasman. I followed a shoreline lapped by tiny surf, and set my tripod in the sand every few minutes, only to discover that my lens cap was missing. 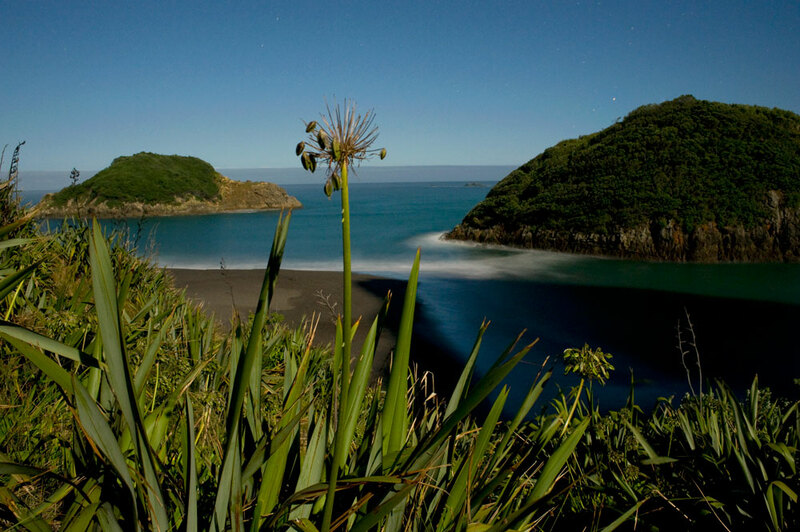 Retracing my steps along the deserted beach, I saw the moonlit reflection shimmy alongside Adele Island (Motuareronui, big island of the swift moving clouds, is its original Maori name). 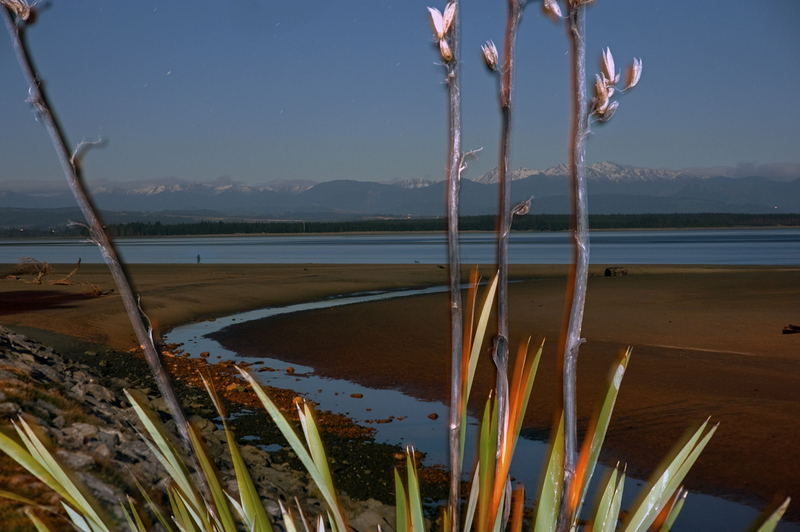 The view east across Tasman Bay made for a brilliant evening, but the outing came to an early conclusion when I found my backup battery was uncharged. However I did recover my lens cap. 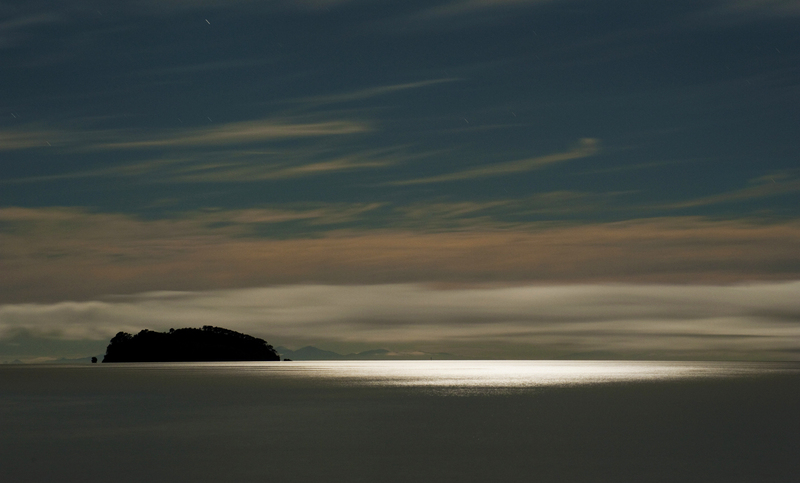 Two frames merged into one, so same ferry twice – each exposure is 30 seconds, by moonlight. The Point is at St Heliers; it’s a good lookout as long as you don’t get caught (as I did) by the local council’s draconian parking restrictions. Park well down the street! Copyright images in 16:9 wide screen ratio, posted for free download as background wallpaper on your desktop (a right-hand click of your mouse over any image will show this option). Downloads are for personal use only. To Barney’s pulpit rock I climb / Where the sea aisles burn cold / In fires of no return / And maned breakers praise / The death hour of the sun.